You can grow walking onions, also called Egyptian walking onions, tree onions, winter onions, and perennial onions. Unlike an ordinary onion plant, Allium proliferum will produce little bulbs at the top of the plant in the summer. The weight of these marble-sized bulbils will pull the stem down, enabling the bulbils to root and produce a new plant. Although walking onions seem to walk by producing new plants a few inches away, they are not invasive. Walking onions are very hardy, perennial plants in our Virginia area. They are also “passalongs,” easy to give away to friends. I received mine from a fellow member of the Potomac Unit of the Herb Society of America. I was interviewing her at her Falls Church home for the Potomac Unit newsletter because she had been a member for over 25 years and had quite a lot of herbal experience. After we talked in her living room, we walked around her herb garden and she snapped off a few bulbils from an enormous tub of walking onion plants. She said when her kids were young, they used to grow them along the fence and weave the stems in and out of the holes. The tub of plants came from her original set about 30 years ago! That was five years ago and so far, my plants have thrived enough that I can now pass along plants to friends as well. Walking onions prefer full sun, organic matter, and well-drained soil. They grow to 2 to 3 feet tall with hollow green stems. All parts are edible. If you cut the stems for cooking or salads, cut only a few stems at a time and don’t cut the ones that have bulbils. Stems can be eaten fresh in salad or cooked. You can cut the bulbils when they form in the summer and use them for cooking or pickling. In the fall, the entire plant can be dug up to harvest the underground bulbs. Simply divide and used some of the bulbs like you would with regular onions in the kitchen and re-plant the rest. You Can Grow That! is a collaborative effort by gardeners around the world to encourage others to grow something. Gardeners usually post articles on their blog on the fourth day of the month (fourth day, four words: #1: You; #2: Can; #3: Grow; #4: That). Posted in Edibles, landscape edible, You Can Grow That! Tagged Egyptian onion, onion plant, perennial onion, perennial plants, Potomac Unit, tree onion, walking onion, winter onion, You Can Grow That! 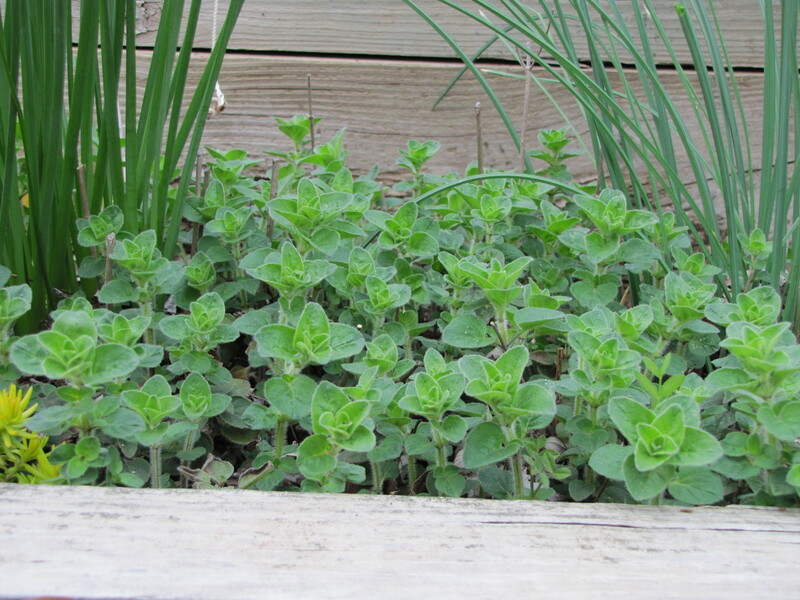 Herbs are the easiest edible plants to grow. Many are well suited for containers while others thrive as perennial plants in the garden bed. I find that I have no problems with animals and insects, probably because of the pungent oils in the leaves. Most of my herbs are for cooking and teas, but I also buy plants that I read about so often I just have to see what they are like (rue, for example). In order to remember what I have (or to inspire me to use them in meals), I keep a list on the inside of a kitchen cabinet. The photo is last year’s list; it is a computer file that I still have to update for this year. The notches are the plants that were large enough for me to take cuttings in April this year to bring to my garden club at the office. 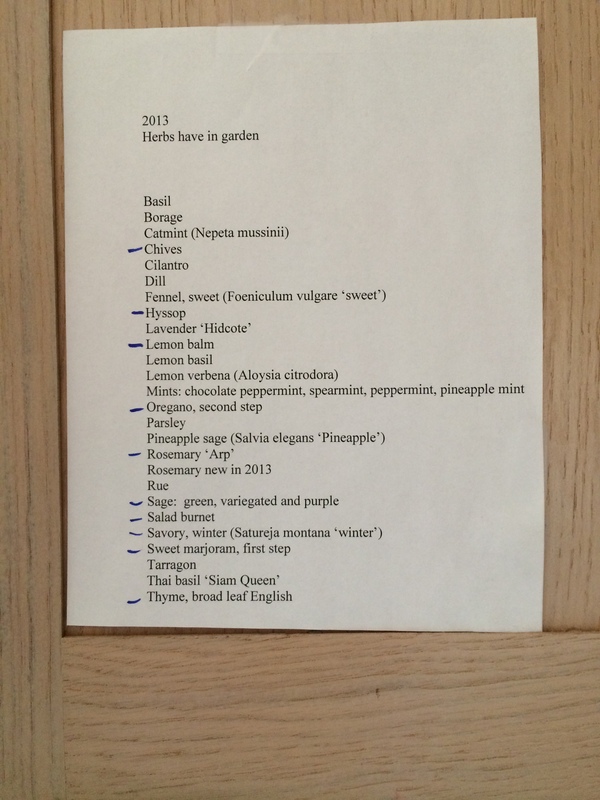 I was showing my colleagues the variety of perennial herbs that they could grow in the garden but this list also illustrates how early in the season you can harvest most perennial herbs. On this particular list, the chives (put in eggs and butter), fennel (add to fish), hyssop (admire), lavender (cut flowers), lemon balm (put in fruit salad or make tea), oregano (pasta sauce), rosemary (potatoes, biscuits, chicken), rue (admire from a far), sage (biscuits and tea), salad burnet (green salad), winter savory (great winter interest plant), sweet marjoram (pasta sauce), and thyme (biscuits, chicken) are perennials. The basil (pasta, tomatoes and French bread), borage (beautiful blue flowers), cilantro (fried rice), dill (egg salad), lemon basil (fish), lemon verbena (tea), mints (tea and fruit salad), parsley (potatoes ), pineapple sage (tea and fruit salad), and Thai basil (fish) are treated as annuals in Virginia. The fennel and tarragon are coming back this year but were too small to cut in April. 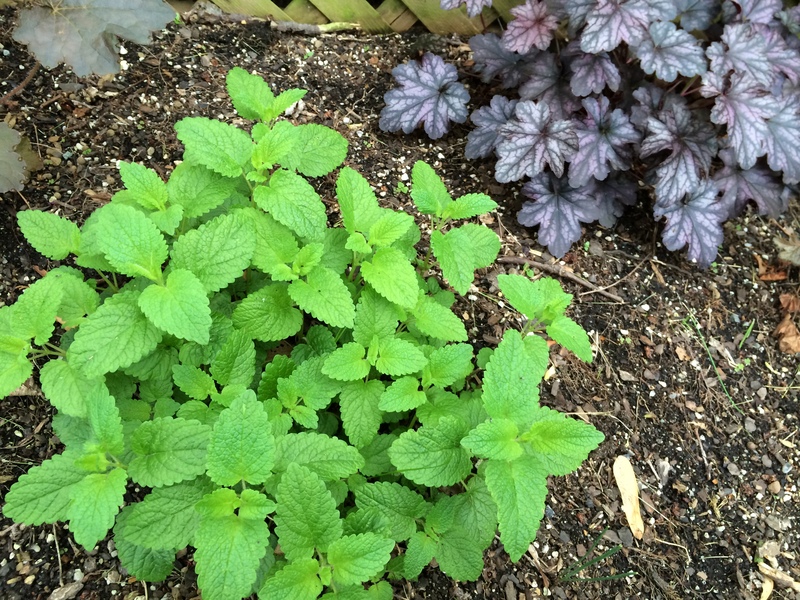 I think the neighborhood cats stole the catmint; I can’t find it. But no loss, it only opens up space to add my new Korean mint (because I read about it), tansy (to repel pests), and zinger hibiscus (also because I read about it but I think I will use for tea). I may still buy artemisia as it is the herb of the year and I hear that savory is the herb of the year for 2015 so I definitely will have to add summer savory to the list. 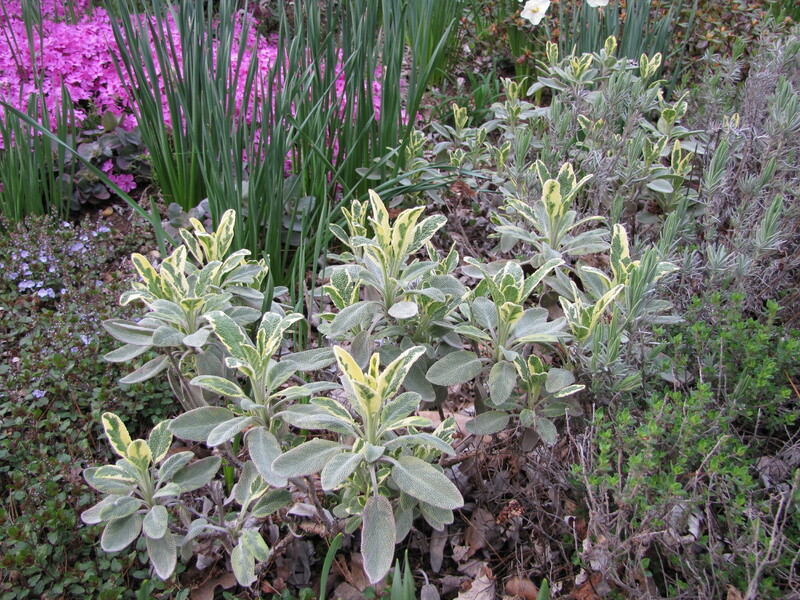 If you are interested in herbs make sure you visit the National Herb Garden at the U.S. National Arboretum or join the Potomac Unit of the Herb Society of America. Although you can easily buy herb plants and seeds at the major nurseries in this area (see tab above), two that specialize in herbs are DeBaggio’s Herb Farm & Nursery in Chantilly, VA; and Willow Oak Flower and Herb Farm in Severn, MD. The Herb Society of America also is a great resource and our public library systems have more than enough herb books for you to enjoy.